An easily spotted resident of Ocracoke – both in the village and throughout much of the island – is the Northern Mockingbird (Mimus polyglottos); a bird of such fascination that it has taken on the status as a cultural icon. Let’s take a look and see why. Mockingbirds are long, slim grey birds with pale yellow eyes, and very visible white wing patches that can be seen in flight. They like to perch near the tops of small trees and bushes as well as on telephone wires. Widely distributed, they can be found in all 48 of the contiguous states and parts of southern Canada and Mexico. As their name implies, they are able to mimic songs of other birds and even other sounds including sirens and whistles. You can identify a mockingbird because it typically repeats one song sequence usually four to six times and then it will change to another series. Although both sexes sing, it is the male that is the most vocal and capable of a great number of song types – up to 200 variations according to one estimate. Unlike most birds, they will also sing in the post-breeding fall. Northern Mockingbirds eat mainly insects in summer and will switch to mostly fruit in fall and winter. This change in diet permits them to stay farther north in the winter when available insect food is scarce. When on the ground they may suddenly raise their wings and display the white patches. One theory for this behavior is that it stirs up insects. Both the male and female are involved in the nest building with the male doing most of the work. 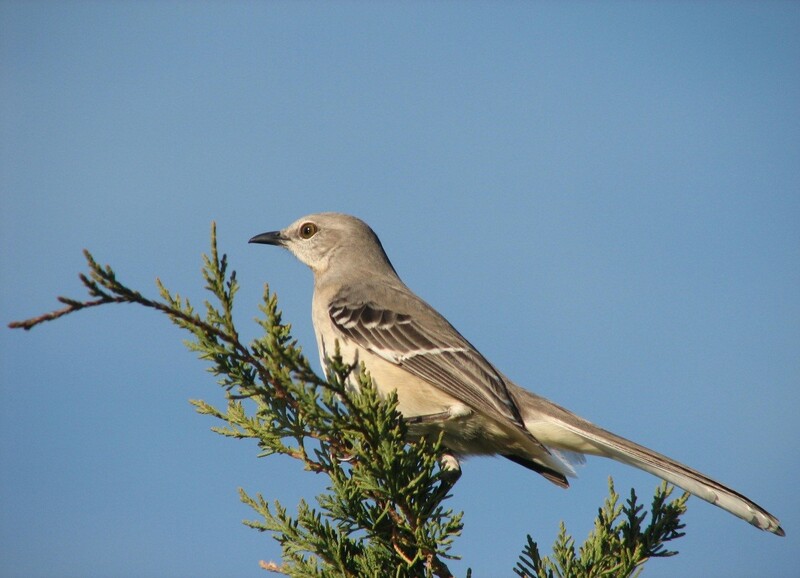 The mockingbird is the state bird of Arkansas, Florida, Mississippi, Tennessee and Texas. (For North Carolina it is the Northern Cardinal). During the 1800s it was often captured and kept as a cage bird which explains the traditional lullaby that begins: “Hush little baby, don’t say a word, Mama’s gonna buy you a mockingbird. And if that mockingbird don’t sing, Mama’s gonna buy you a diamond ring.” Fifty years ago this bird was immortalized by the title of the Harper Lee novel To Kill a Mockingbird. Its significance appears where the children are warned, “It’s a sin to kill a mockingbird because mockingbirds do no harm. They only provide pleasure with their songs. They don’t do one thing but sing their hearts out for us.” Some walking too close to a nest may take a bit of exception to this romanticized and anthropomorphic image as these birds can be rather aggressive by defending their territory, and it is not unusual for a person or pet to be dive-bombed, especially in late summer. Nevertheless, the significance of the mockingbird in this novel has been speculated upon in countless high school and College essays many read by our own great and now famous English teacher, Charles Temple, who has taught this novel at our high school. Hey Charles, in preparation for the upcoming tournament of champions here’s a softball for $100: “This scary neighbor was an endless source of fascination to Scout Finch.” Anyone else?